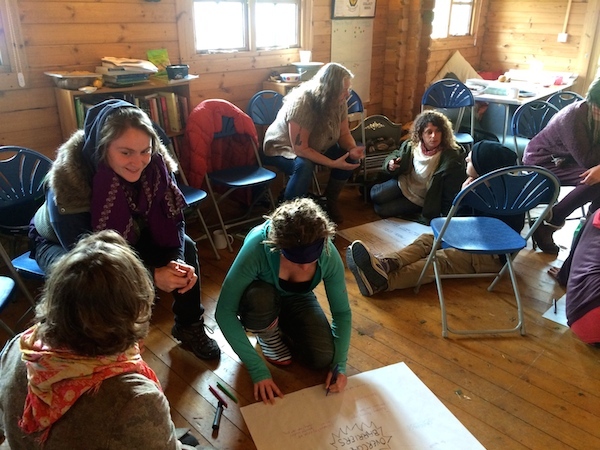 This weekend an incredible learning experience took place in Somerset. 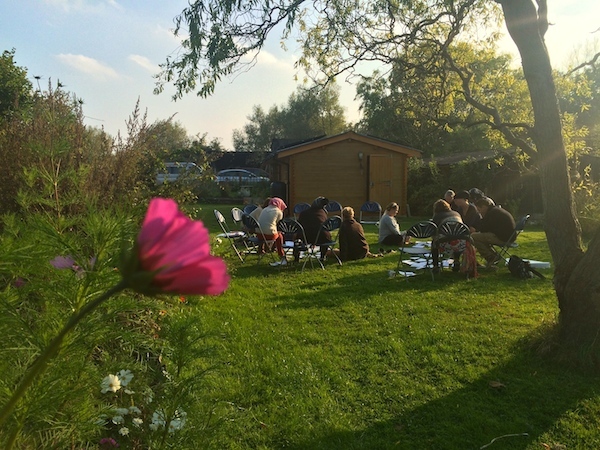 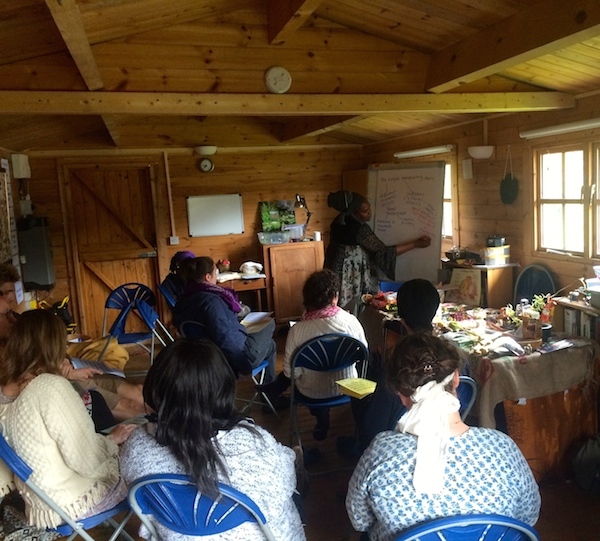 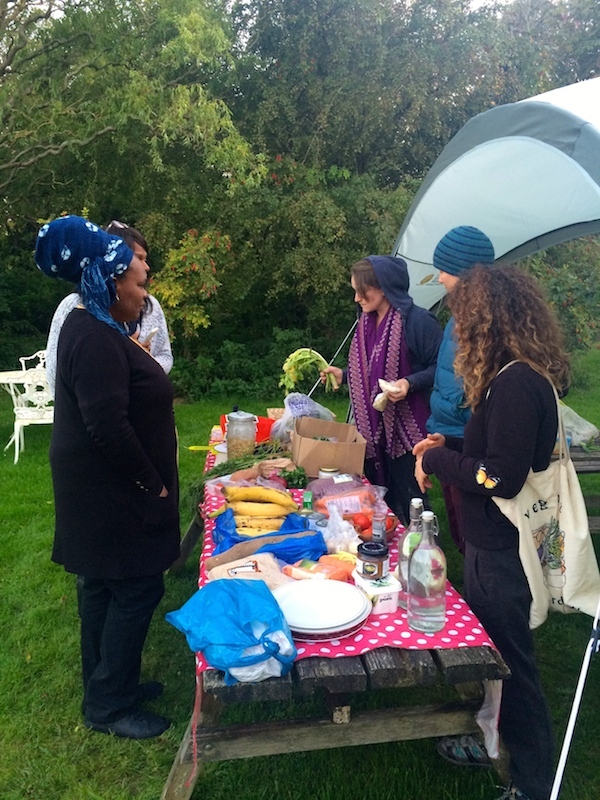 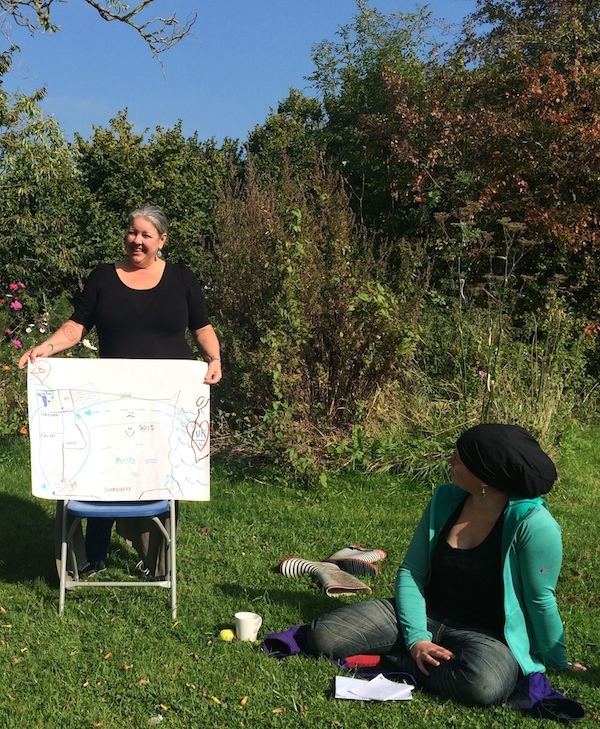 People from the local area were joined with folks from London, Bristol and beyond to share a weekend exploring food sovereignty. 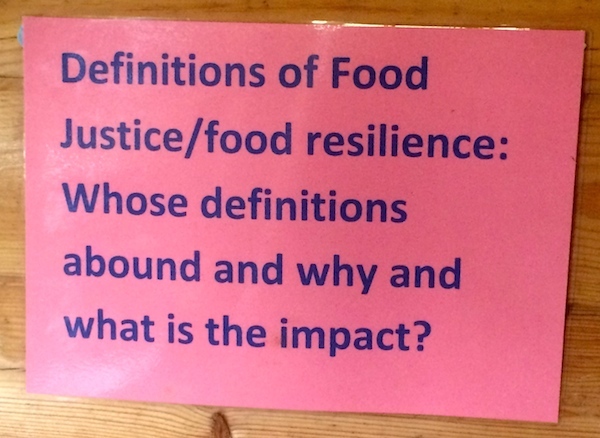 Food Sovereignty is the right of peoples to healthy and culturally appropriate food produced through ecologically sound and sustainable methods, and their right to define their own food and agriculture systems, as defined in the Declaration of Nyeleni in 2007. 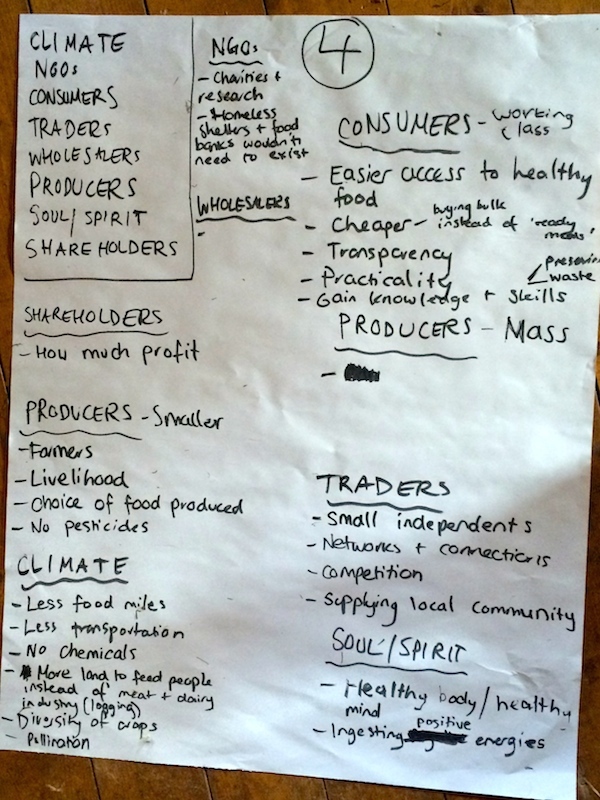 It is a solutions focused framework that defines core principles for which a sustainable, life-supporting food system would be based on. 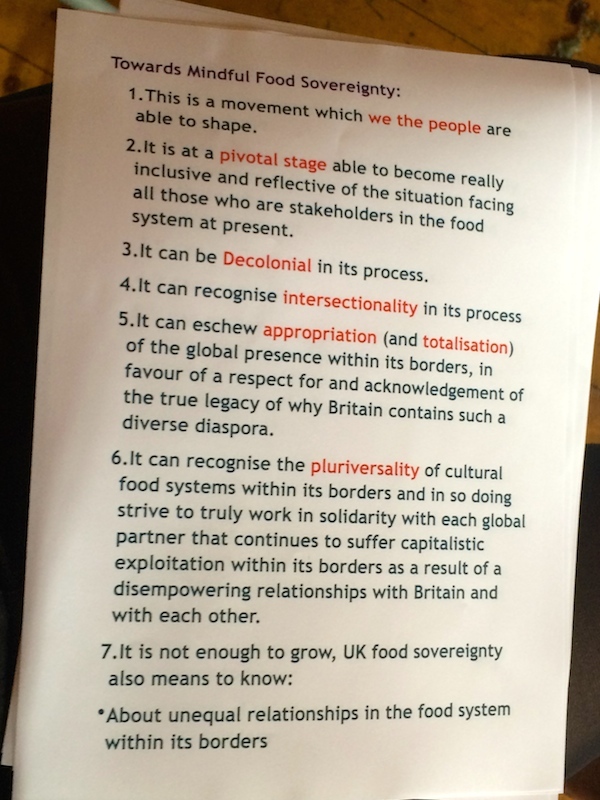 Food Sovereignty has emerged from international peasant movements under the banner of La Via Campesina in the Global South. 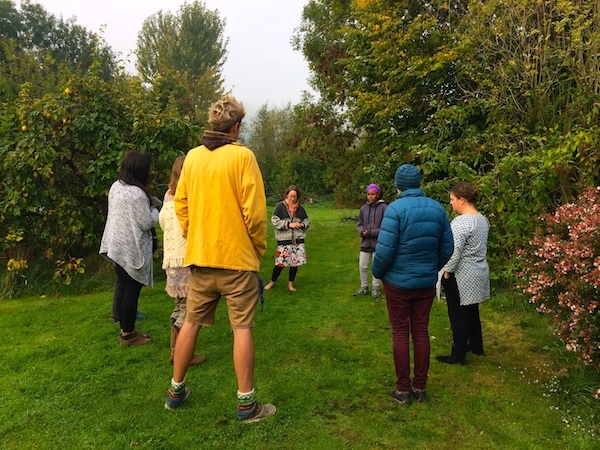 We began the course starting from where we are – introducing ourselves and what food sovereignty means to us personally. 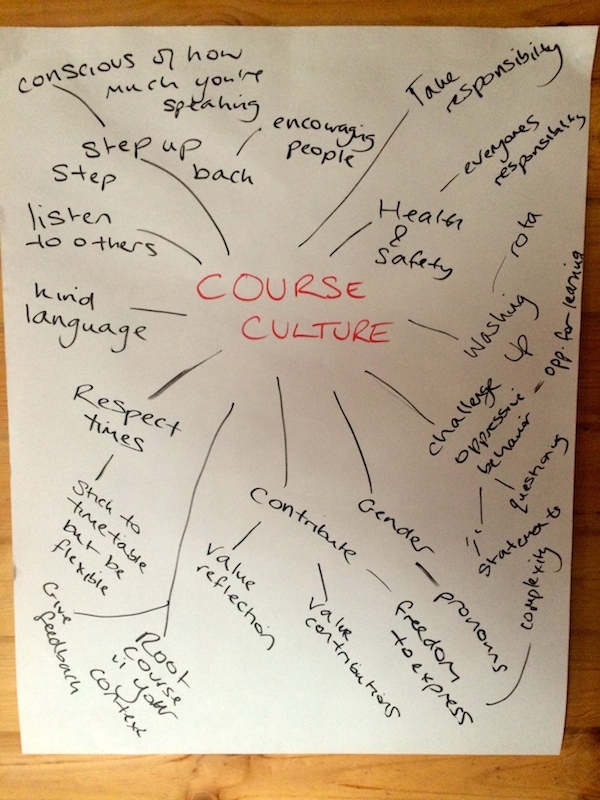 We knew the course has to be relevant to our lives. 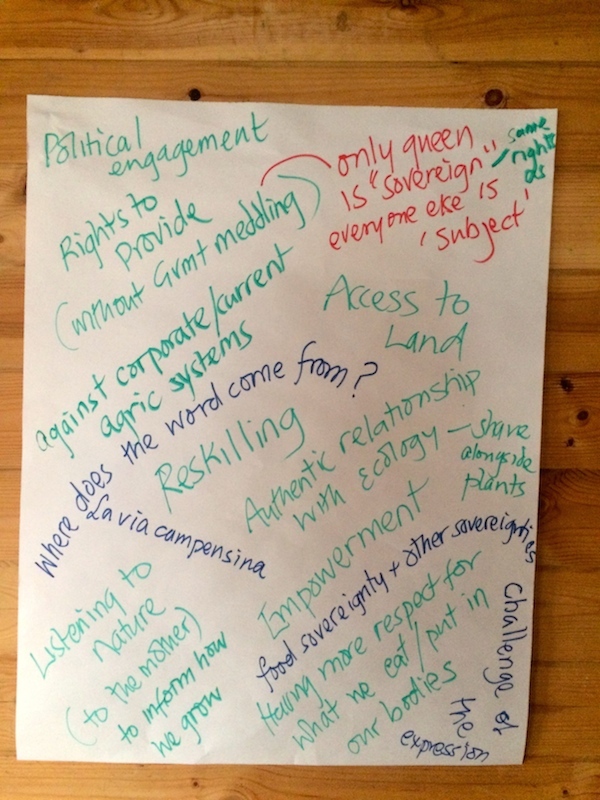 We explore the fundamentals of food sovereignty. 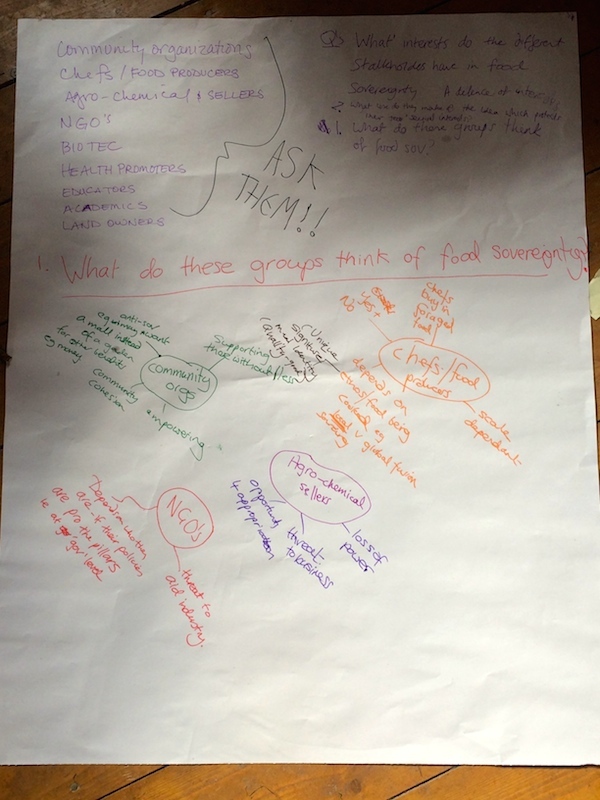 We did this by watching the film La Via Campesina in Movement… Food Sovereignty Now! 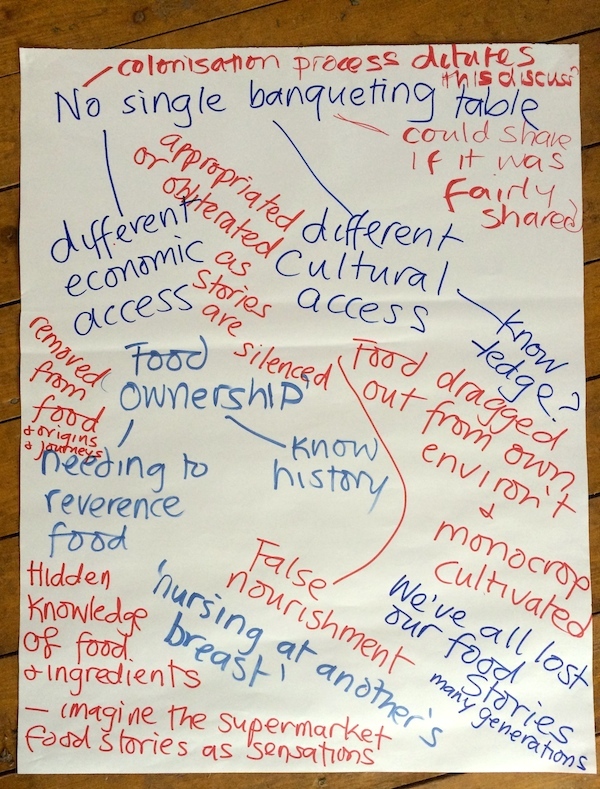 and using at as a tool to identify key moments in movement history, key actors and the key principles of food sovereignty. 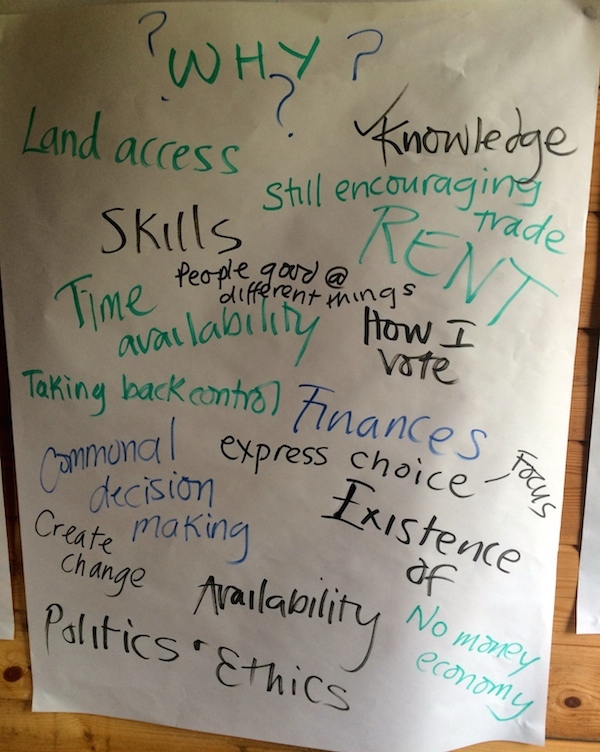 We then looked at the Six Pillars of Food Sovereignty: Focuses on Food for People, Values Food Providers, Localizes Food Systems, Makes Decisions Locally, Builds Knowledge and Skills and Works with Nature. 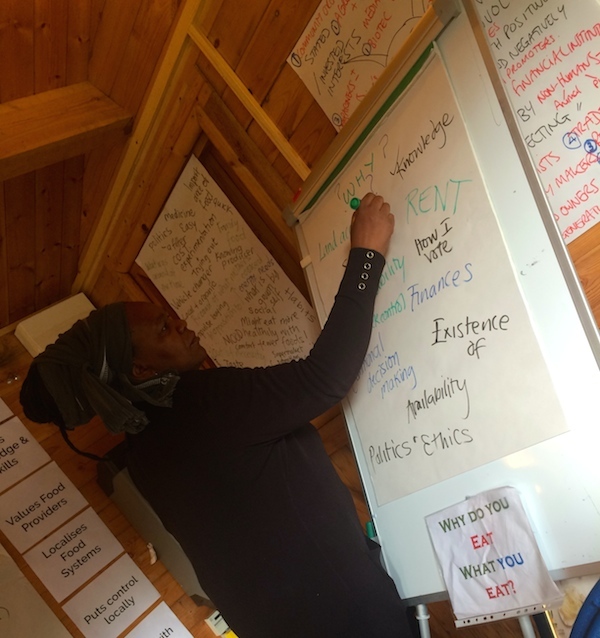 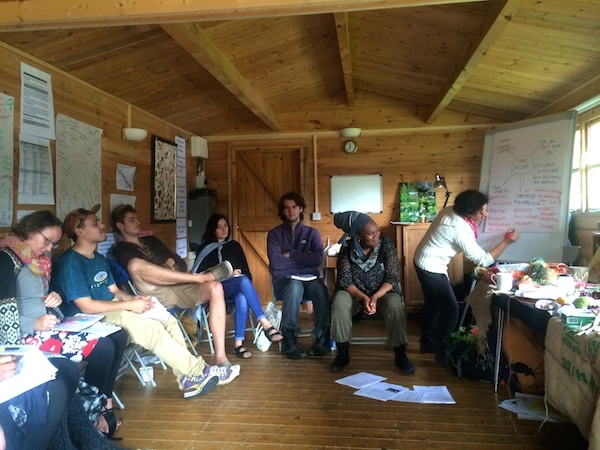 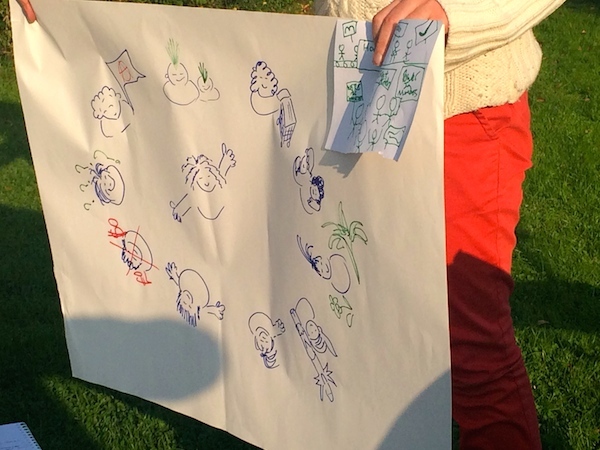 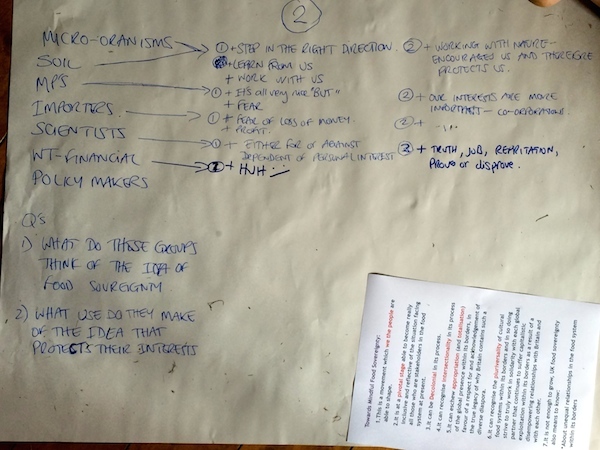 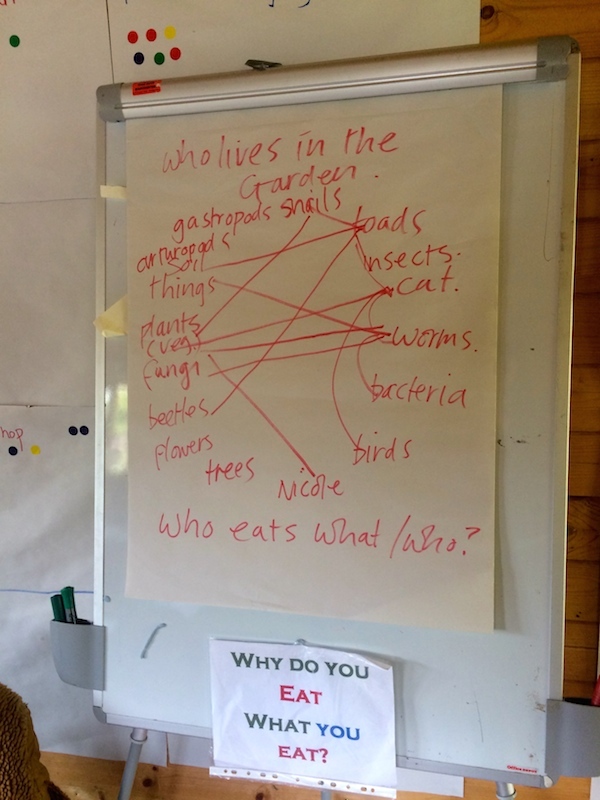 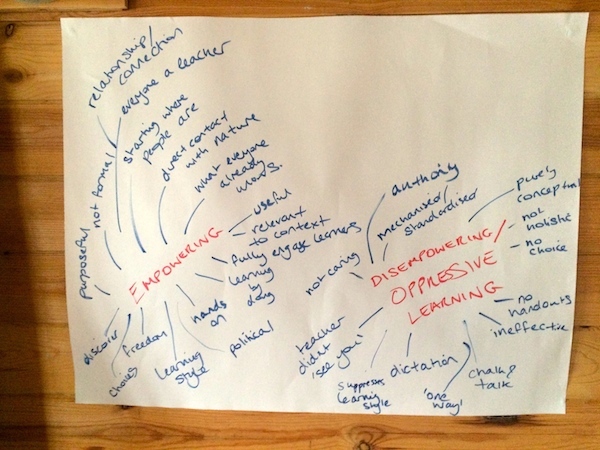 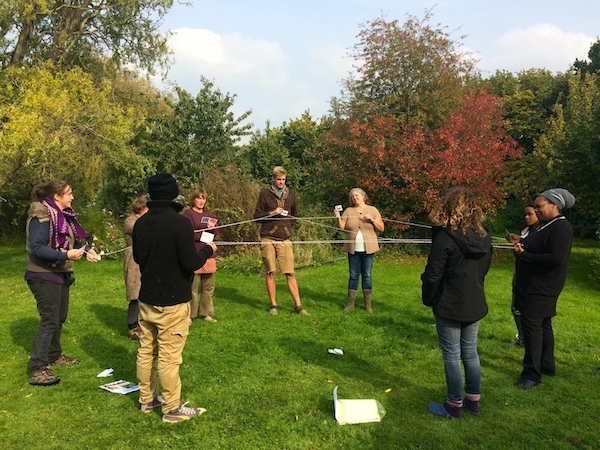 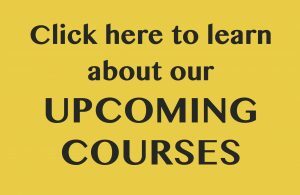 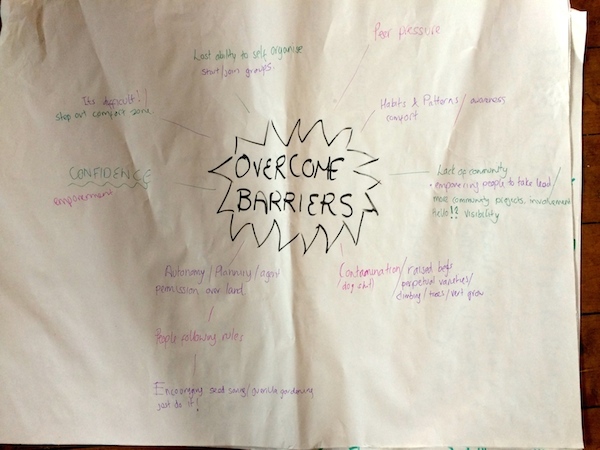 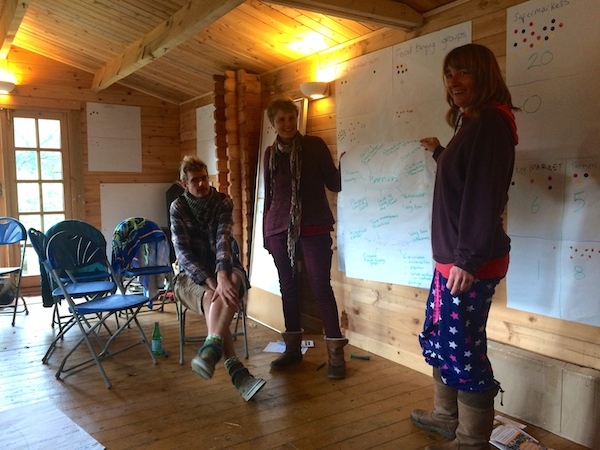 Popular education was a huge theme of the course – we explored what it is, what oppressive and liberatory learning experiences we have had, and how we can use it to build food sovereignty (see the handouts for more information). 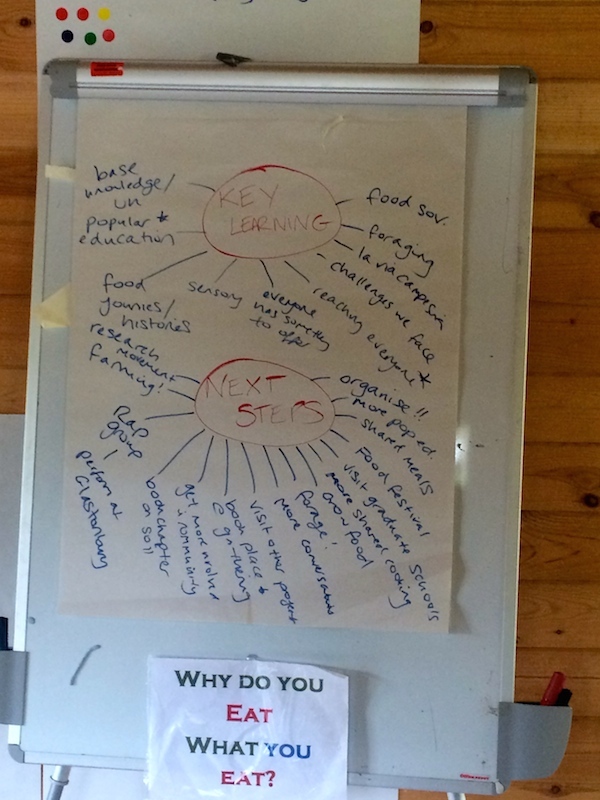 The whole course was stacked in with different facilitation tools so learners could take away workshop designs, resources and tools to use in their work. 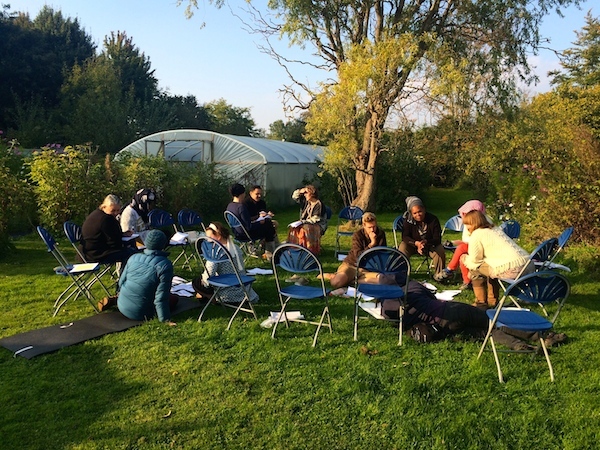 On the third day, participants also facilitated their own mini-practice and received feedback to develop their practice. 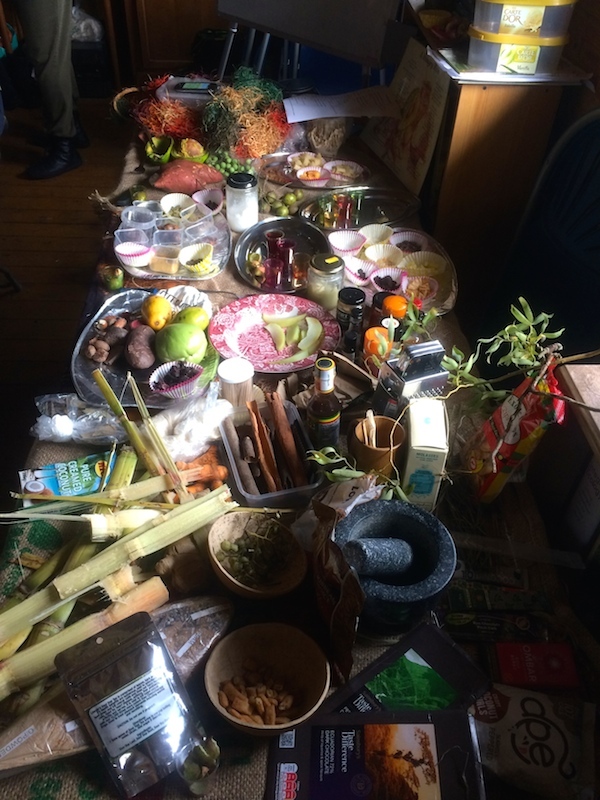 We made collective meals, learning about where the ingredients were from and the food journeys (contemporary and historically) they have. 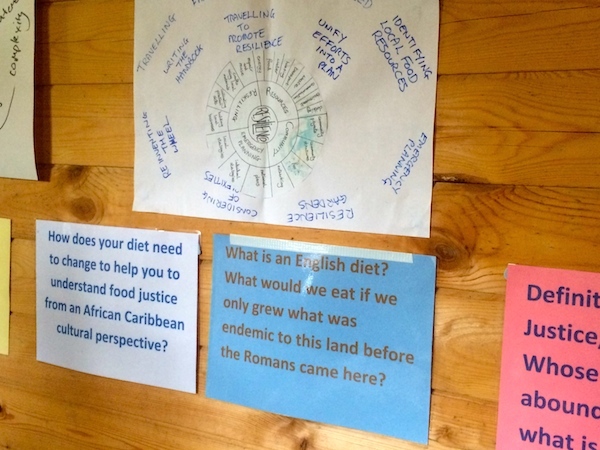 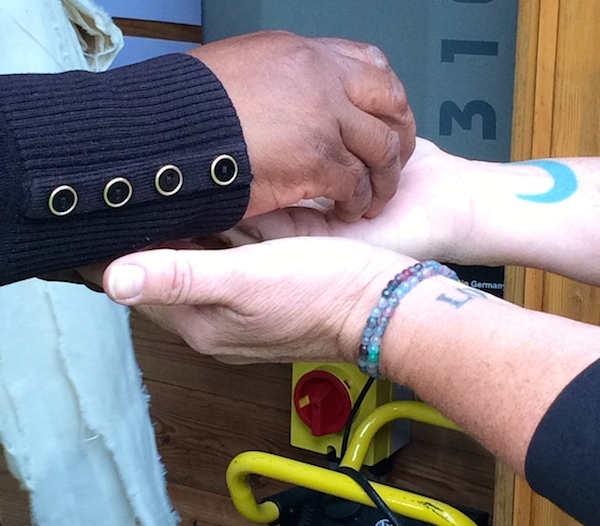 We explored the colonial legacies of the UK, including the slave trade. 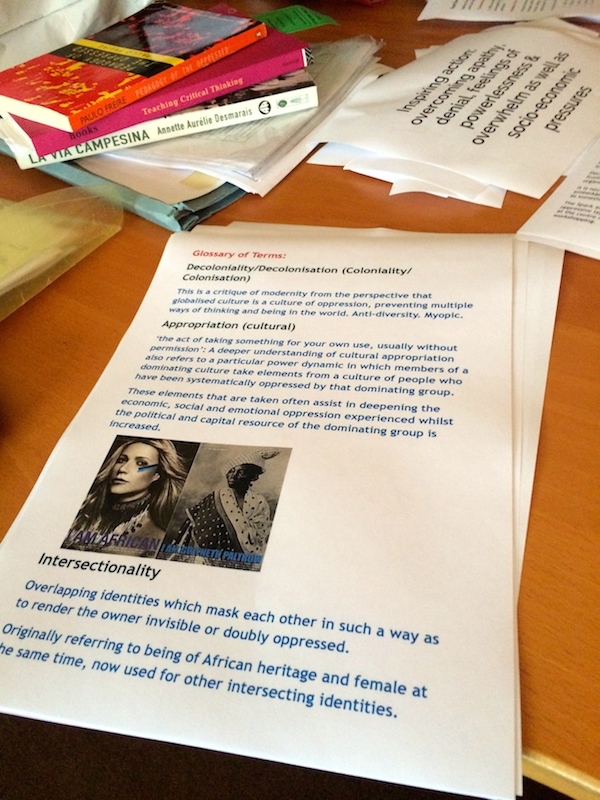 We looked at decolonisation, intersectionality and cultural appropriation. 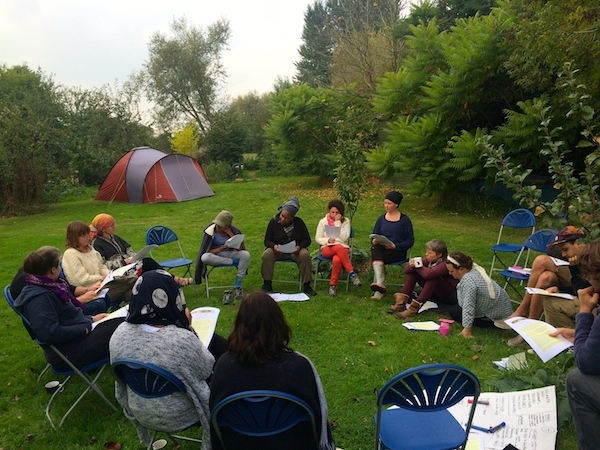 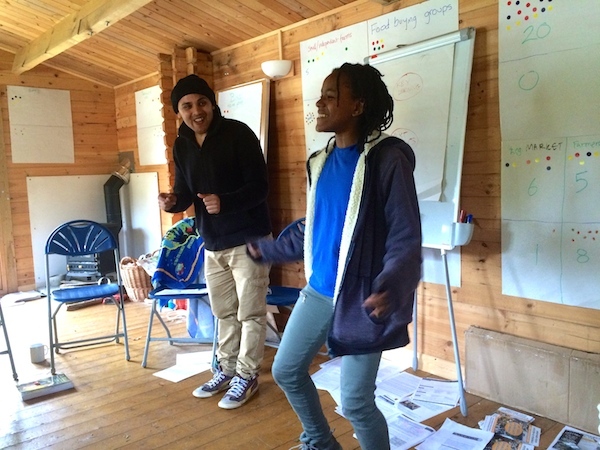 Participants experienced a truly experiential workshop that was emotionally moving and stimulating. 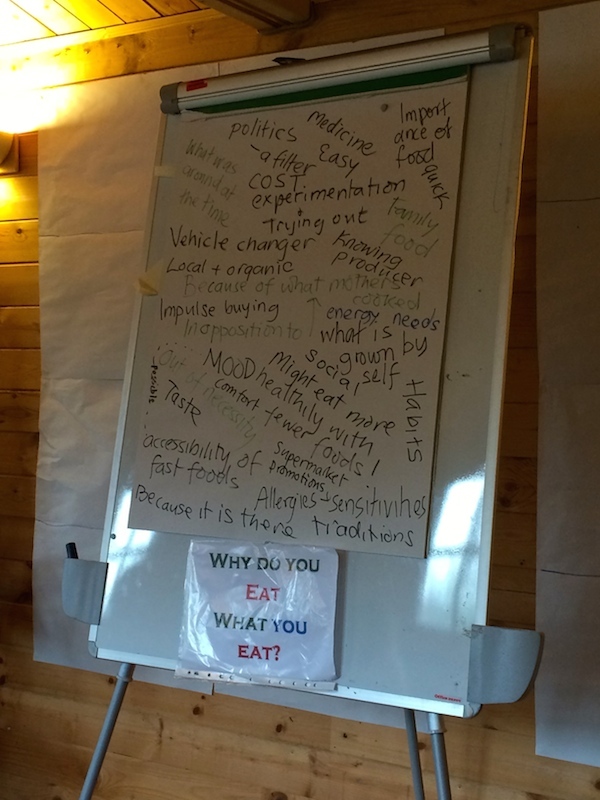 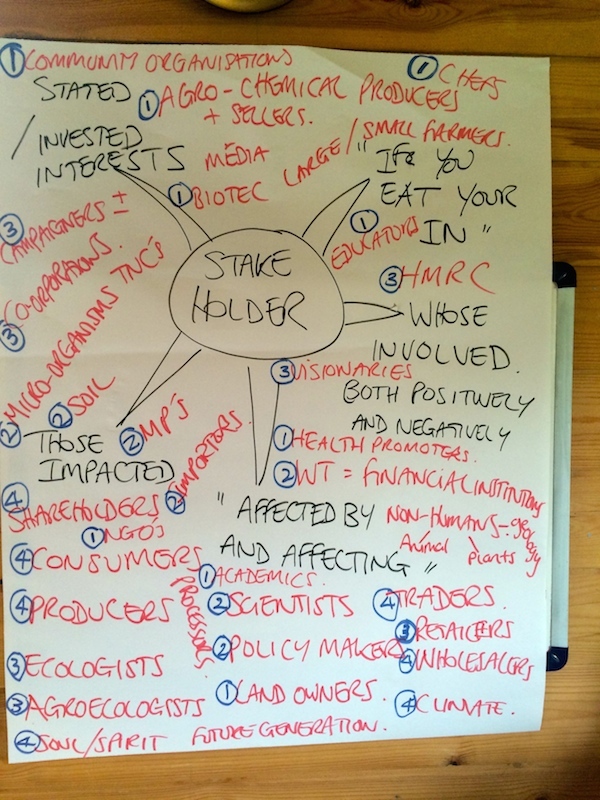 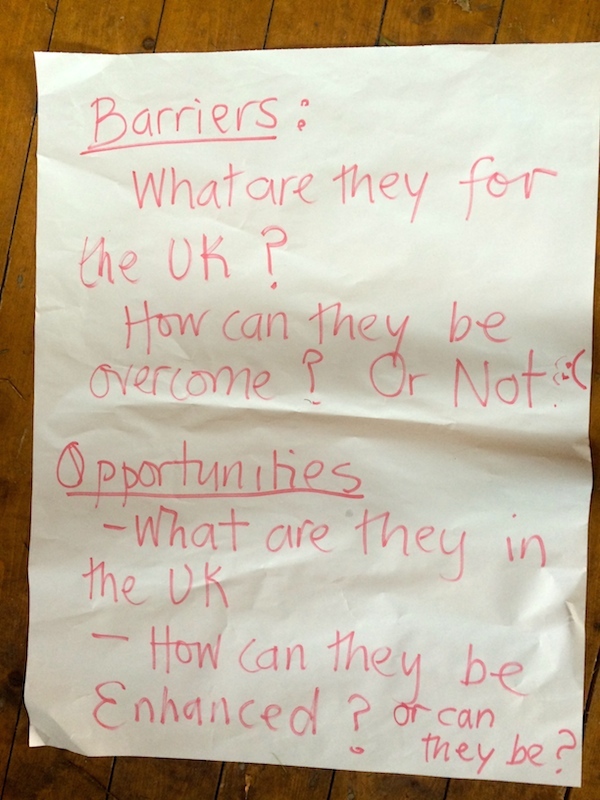 We looked at how these feed into shaping food sovereignty in the UK. 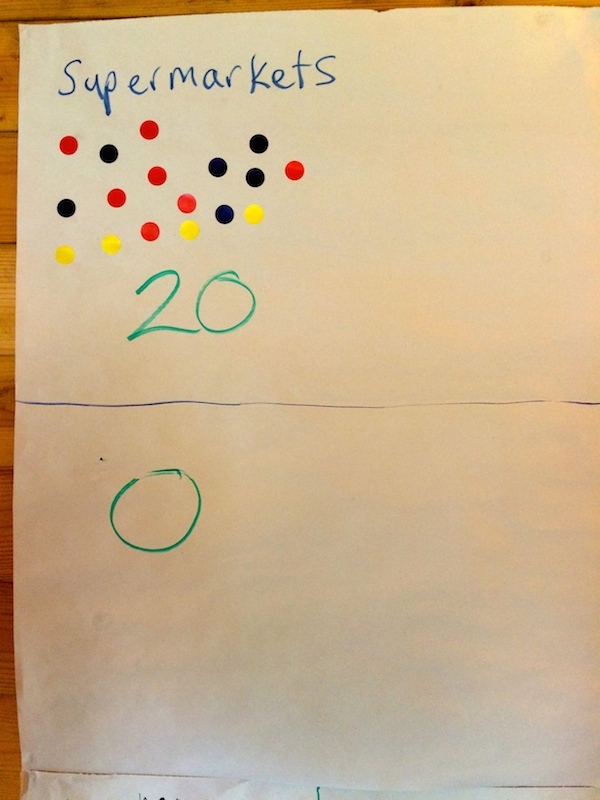 We tried to identify the elephants in the room and observe who was not present in our group or in our conversations. 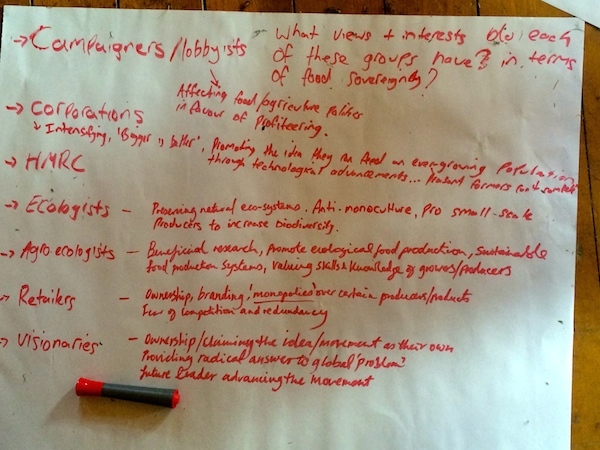 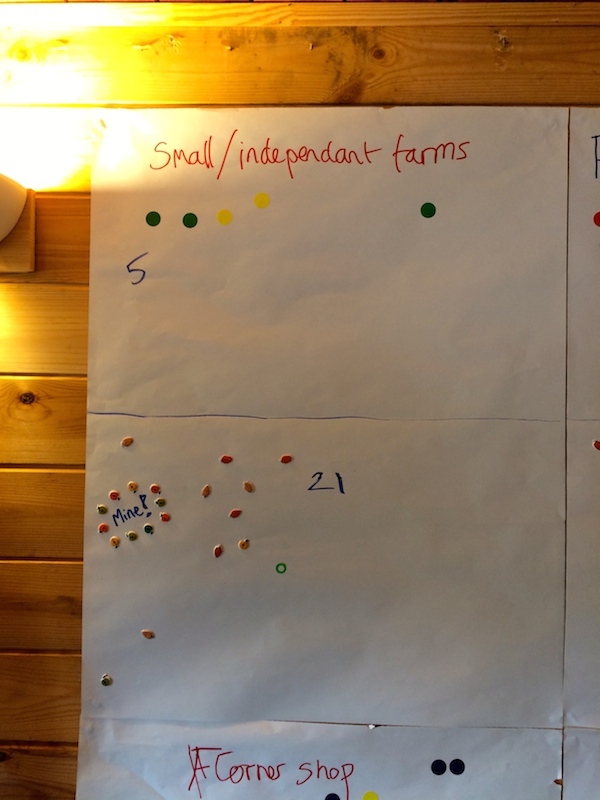 We had a plenary exploring some of the key issues for food justice and food sovereignty in the UK. 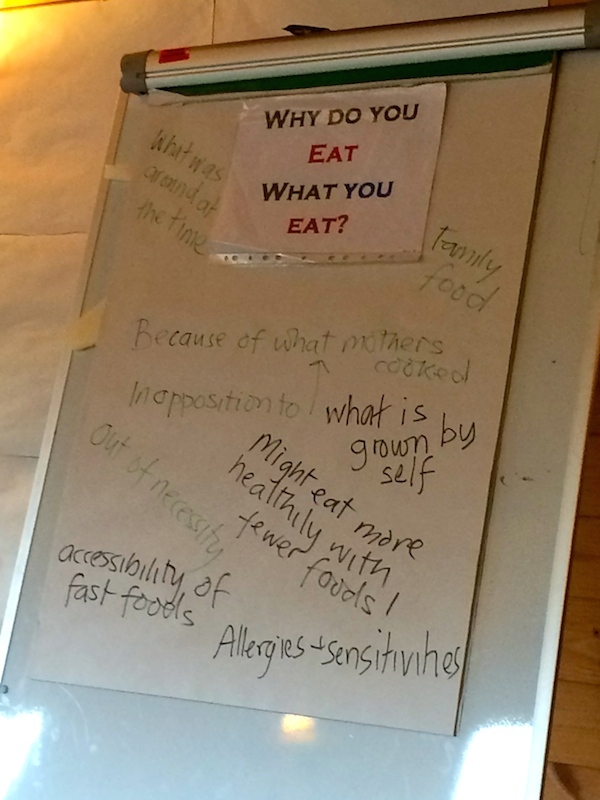 We dived into more depth about where we were currently getting our food from and what motivates us. 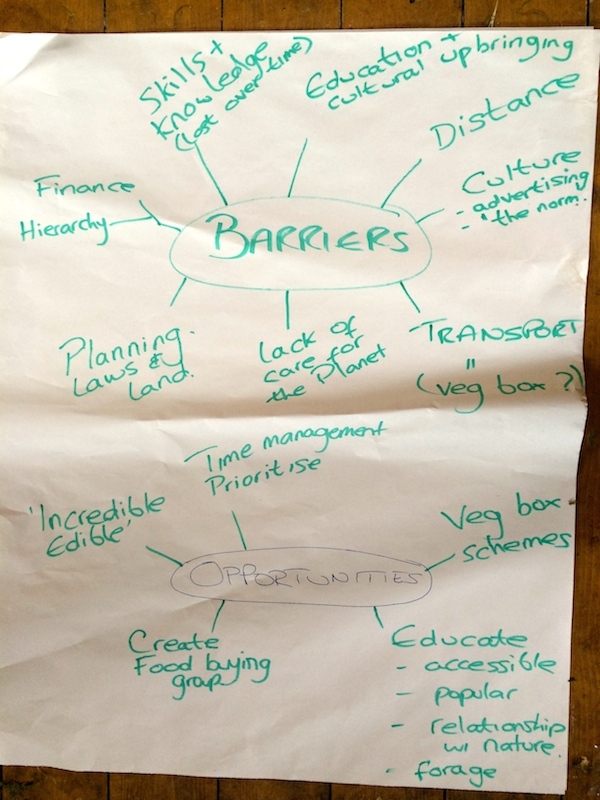 We looked at where we’d like to be getting our food and some of the barriers and opportunities at play in changing the food system. 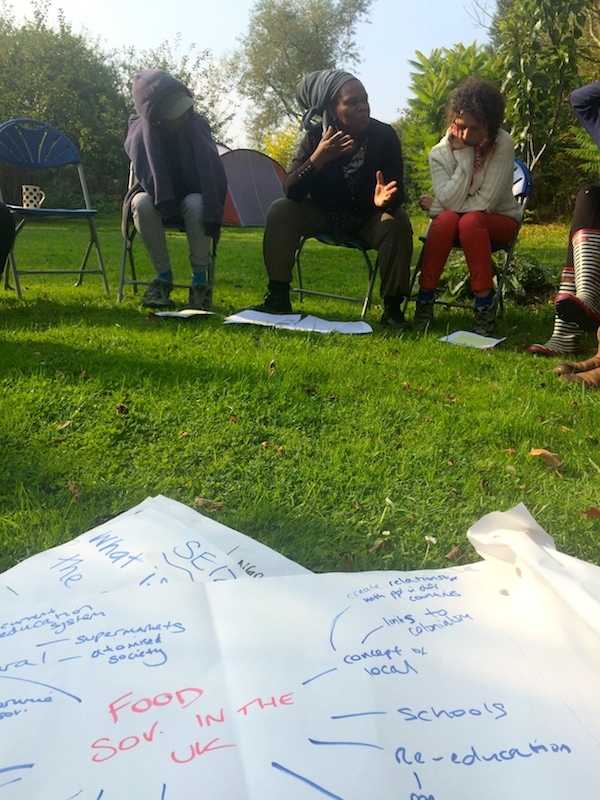 Finally, we shared our evaluations of the weekend and our next steps. 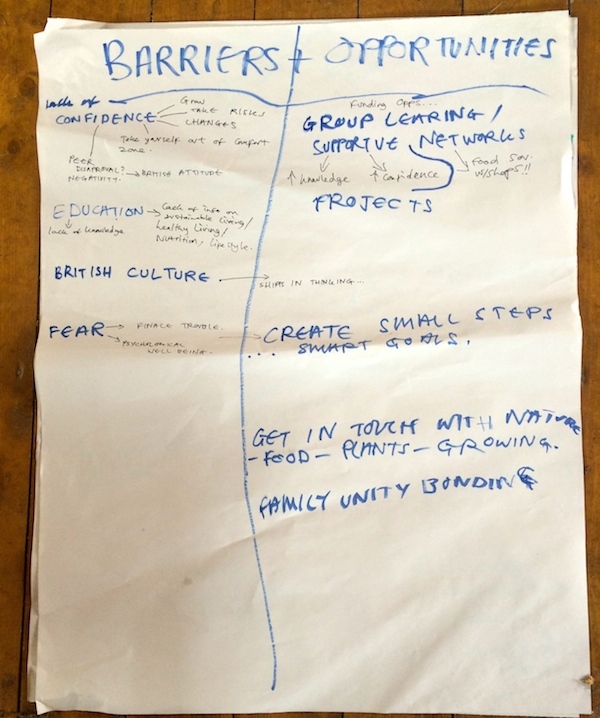 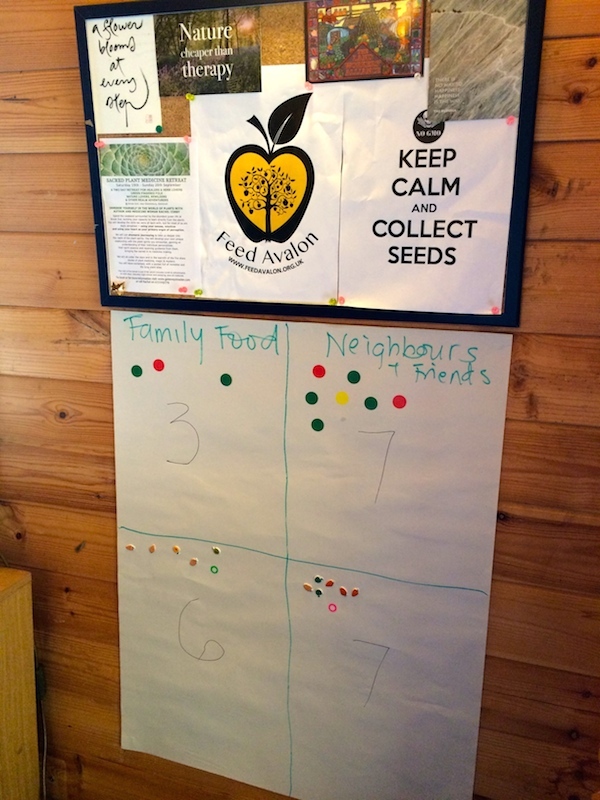 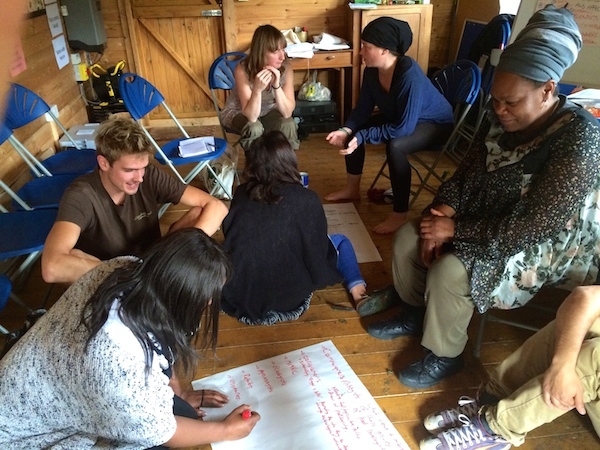 Everyone felt inspired to get more involved in building a movement for food sovereignty in the UK and playing an active part in it. 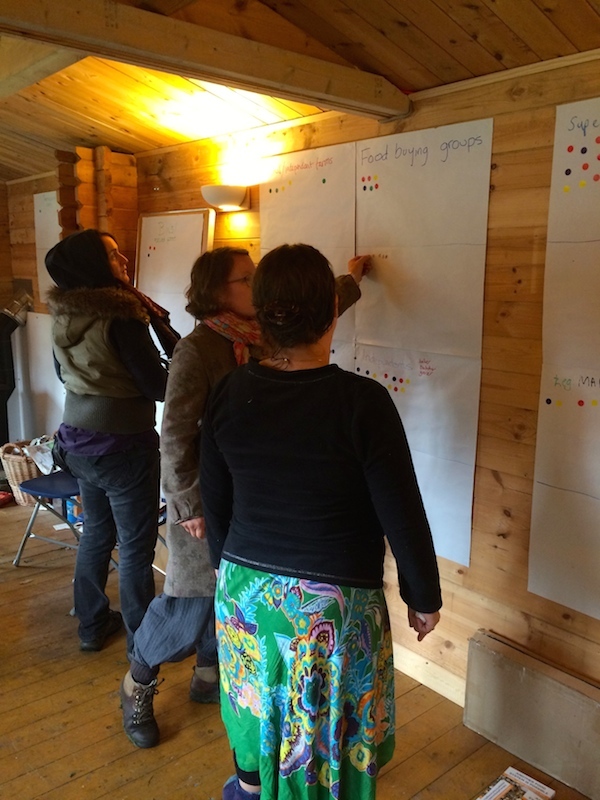 Including attending and participating in the National Food Sovereignty Gathering at the end of October. 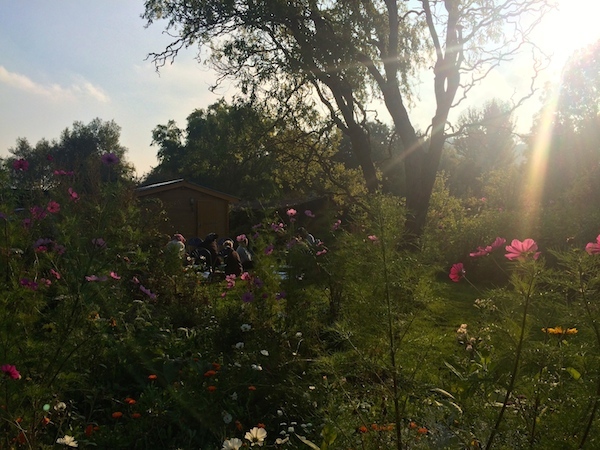 See photographs from the weekend below.